It is the era of digital media, an era of innovation and new forms of communication. The digital media company PK Online launched http://www.hello1.in a new content distribution product during the last week of the month of June 2013. 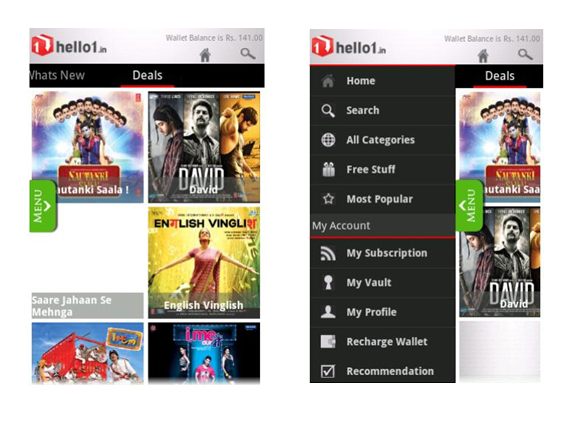 Hello1 is a digital content store accessible on multiple devices from feature phones, smart phones, PC to smart TV. This website’s current content categories include Live TV, Movies, Music, Apps, and Games and in future will include eBooks and magazines. In keeping up with the current online culture Hello1 supports both pay per use/download and subscription based services. This service is on self developed content delivery platform. PK online has been behind many successful content distribution products like Hello TV and also runs Adchakra which is a cross channel Ad network. PK’s Ad Network business complements this initiative by acting as the audience acquisition engine for the service. Their current content partners include leading players like Zee, Universal, UTV, Reliance, Times Music etc. It is also looking to add more Indian and international partners. The real time and transparent revenue reporting feature enables content partners to stay updated on the performance of their catalog. Hello1’s monetisation strategy is based on operator distribution and direct to consumer model. It is currently integrated with leading operators like Vodafone, MTNL and Idea as an off deck service. PK is open to license the platform to content owners who want to set up their own digital destination. Facebook today is the face of social media, keeping this in mind, facebook users can directly register on Hello1’s FB application http://goo.gl/V4okL. Other than this the company also plans tie ups with all leading ISPs, MSOs and Mobile operators to offer consumers to pay through operator accounts in coming months. The other important features about this new media innovation are that it is a one stop destination for all types of digital content with a single account and subscription for all devices, a digital cloud based Vault for re-downloads, an automatic device adaptation for seamless rendering across 7000 feature phone models and it is a native app for Android and iOS. A large number of youngsters today use these operating systems.